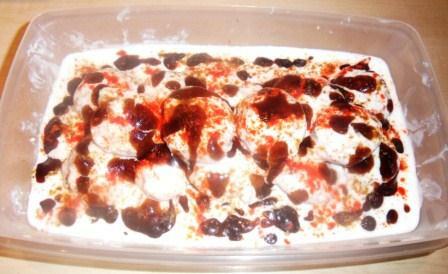 Everyone has their signature dishes and one of mine is Dahi Vade. It is a classic North Indian accompaniment which you will definitely find at all events. I have not met a single person till now who has not liked Dahi Vade. They are basically fritters made with urad daal (lentils) and served with a lot of curd. They act as cooling agents and when served with the classic Indian toppings, they make a very good and filling dish on their own. If making from scratch, you can soak urad daal overnight and then grind it to make a coarse paste. However, these days everything is available in the market making things easier when you have little time to prepare. 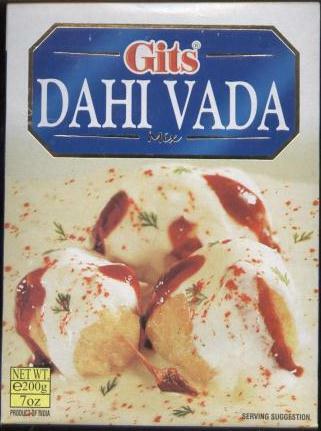 Gits is a very popular brand which has the dahi vada mix already prepared. You just need to soak it in water as prescribed and make fritters. Soak GITS Dahi Vada mix with water as mentioned on pack to get a thick batter. Drop spoonfuls of the batter in hot oil. Once the fritters are golden brown, drain them on paper. Soak them in plain tap water for 10 mins till soft. Squeeze out the water gently without breaking the vada. Add a little water and a pinch of salt to Total Greek Yoghurt to make it thin. Soak the vade in it for 2-3 mins so they absorb the yoghurt and puff up. Line them in a container or a plate. Once all the vade are prepared, coat them with the remaining yoghurt evenly. Decorate with tamarind chutney and garnish with salt, black salt, red chilli powder and cumin powder before serving. Prepared vade can be stored in air tight container in the fridge for upto 15 days. My husband and I have got into the habit of carrying our snacks with us when we go out. They are healthier and tastier than ready made ones and cheaper to boot. They also give vent to my creative juices as I keep trying out new things which is an added plus. 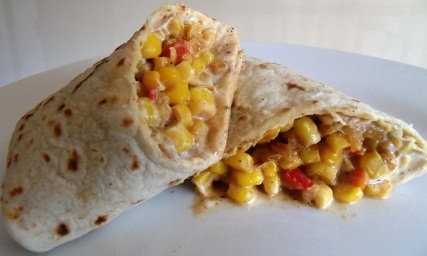 The other time we carried these corn wraps with us when we went out. They are delicious whether hot or not and quite filling too. Heat 2 cups of water in a pot and add the sweet corn. Simmer for 5 mins to release the starch. Drain the water. I use packages sweet corn so this is also a good way of defrosting them. Mix Total Greek Yoghurt with mint and tamarind chutney and keep aside. I use ready made chutneys as they are easily available in the market. You can also simply add salt and pepper or any other sauce you like. There is no need to add sugar as Total Greek Yoghurt imparts its natural flavor and the corn lends its sweetness to the dish. Heat oil in a pan. Chop onion and garlic and saute them. Chop red, green and yellow peppers and mix them. Add 1/2 cup of the pepper mix to the onions and saute for 2 mins till they are soft. Add the sweet corn along with salt and pepper to taste and cook for 5 mins. Heat the tortillas slightly so they are warm to touch if using ready made ones. You can also make tortillas at home. Place a tortilla on a plate. Spread a generous spoonful of yoghurt on it. Top it with the sweet corn prepared above. Wrap and serve. Yoghurt is one of the basic ingredients in the Indian kitchen. Especially because the weather is so hot that you need a coolant with your meals. Also, precisely because of the hot weather, it is easy to prepare yoghurt. However, when I moved to London, no matter what the time of the year, you can’t make curd. It won’t set because it is so cold all the time. So you just end up buying some in the supermarket. There are multiple brands of yoghurt available here. In fact, all major supermarkets even carry their own in-house brands. I generally get whatever I can get my hands on. However, when Total Greek Yoghurt from http://www.totalgreekyoghurt.com sent me their line of products to try out, it really was an eye opener. The Total Greek Yoghurt is thick and creamy and made naturally from cows’ milk and live yoghurt cultures. They have a great line of products catering to every person’s dietary need. Total Greek Yoghurt is the basic product, delicious with every mouthful. It has no added sugar or sweeteners and has a mild taste with 130kcal per 100 gm. Total 0% Greek Yoghurt is fat-free but surprisingly light and creamy and perfect for those dieting but with no compromise on the taste with only 52kcal per 100gm. Total 2% Greek Yoghurt is the classic variety but lower in fat, making it ideal for everybody with 62kcal per 100 gm. Total Honey Greek Yoghurt is the perfect combination of Greek Yoghurt and sweet honey in a snack size pot that can be eaten on the go with only 119kcal per 100gm. The entire line of products is also packed in variety of sizes to cater to the individual needs ranging from 500gm to 150gm packs. They also offer value for money as they are priced according to the market rates and offer good quality classic natural yoghurt. The best part of the packaging is the plastic lid on the bigger packs. This really helps in storing the yoghurt in the pot it came in without the need to transfer it to another container. Total Greek Yoghurt is especially thicker than other yoghurt brands so you can use it as a binder in most dishes. It does not break when heated like most other yoghurts. It also tastes good when used in its plain form without any additives making it ideal as a dessert ingredient. There are a number of recipes on the website of Total Greek Yoghurt http://www.totalgreekyoghurt.com contributed by various members which you can check out and try. I have listed below various recipes that I tried out using Total Greek Yoghurt in different ways across yoghurt gravy to direct application. Do check them out. 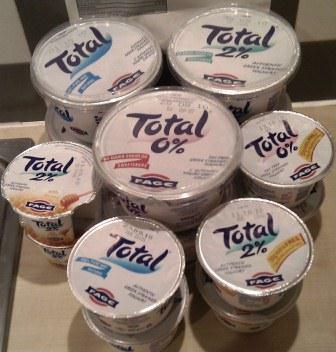 Thank you Total Greek Yoghurt for sending me your products. The above mentioned list of recipes will keep growing thanks to you. Cookie man introduced me to home made cookies. Not the ones you get packed and ready in supermarket but those which are made fresh in front of you. They are fresh and warm and have an amazing sweetness to them. The aroma of freshly backed cookies hits you as soon as you enter the shop. It is an amazing experience and you cannot not buy some. And then when I moved to London where baking is a huge part of cooking, I wondered why not try to make some. I bought a cookie sheet but I was always scared of making them. So after 2 months of resting the cookie sheet in the cupboard and having millions of dreams of milk and cookies, I finally took a chance. I chose an easy recipe for safeguard and I am happy to say, it was everything I could have imagined. The house was filled with the aroma of freshly baked cookies and the best compliment was from my hubby. He ate up the entire first batch without missing a beat and could not wait to have more. Beat unsalted butter and oil with the white and brown sugar till light and fluffy. Add the eggs, salt and vanilla essence and mix together. 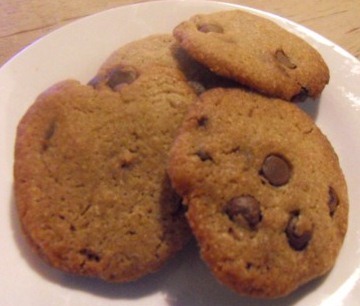 Sift flour and baking soda and mix it with the batter along with the chocolate chips. Line a baking tray with cookie sheet. Drop 1/2 tbsp of cookie dough on the cookie sheet about 2 inches apart from each other. Bake in a pre-heated oven for 10 mins at 175 degrees C till the cookies are golden brown on the edges. Take out the baking tray and let the cookies cool on the cookie sheet for 5 mins. Remove and let cool on a wire rack. The cookies will be crisp on the outside and soft and chewy in the middle. Store in an airtight box for upto 1 week.